The other day, I encountered a blog by someone named David Foster who disputed the claim I and many others have made: that Christianity is about a relationship with God through Jesus Christ, rather than an ‘organized religion’. An interesting point. But just because serious Christians worship God and his son, Jesus, doesn’t make it a religion. Serious Christians – and many others – believe God made this entire universe, including the air you are breathing as you read this essay. You and I would not be alive without some sort of creator, so why shouldn’t He be worshipped? And that’s the precise reason why worshipping God is nothing like worshipping your spouse or boyfriend/girlfriend. Okay, then, David. How do you explain me? My entire biological family bought into the ridicule our culture has for Christianity and abandoned it decades ago. Until 2002, I was with them 100 per cent. Yet, I changed – and it wasn’t because of an awful crisis, either. So my question remains, David: how do you explain me and so many others who were NOT ‘indoctrinated’ into Christian beliefs, yet they still made a life-changing commitment to Jesus? There are all kinds of examples of Jesus doing what most of us would consider nearly impossible. Off the top of my head, I think of Michael ‘Bull’ Roberts, a man who graduated from a horrific childhood to become a gang leader who ran most of the drug trade in the Canadian province of Alberta. Michael’s ‘friends’ in the drug world eventually turned on him, beating him savagely and leaving him for dead. In the aftermath, he turned to Jesus. Today? No more gang activity. No more drug dealing. No more violence. In fact, Michael now spends his time helping street kids, society’s outcasts and people in prisons. I suppose if David Foster and other skeptics want to credit Michael’s new life to an ‘imaginary friend’, they will find a way. But wouldn’t that position smack of the very desperation that David attributes to Christians? So what about you? Where do you stand on the notion of Christianity being a relationship rather than a religion? Post your thoughts below and let’s have a conversation. I had religion once, and even though it did lead me to salvation, it did not change my life. It is when we move beyond the mental assent by faith into the heart knowledge of relationship that we truly get it. Like the Bible states, until the step of faith, these things cannot be attained because they are spiritually discerned. I pray the eyes of his heart are opened so he too may know the gloriousness of relationship with Jesus Christ. I would not go back if my life depended on it. I think the fact that people like David feel persuaded to try and convince others that Jesus is not real is one of the reasons we should know He is! The countless hours put into debates, research, and the passion to discredit Christ is mind boggling to me. After all, how many people try to convince children to leave their imaginary friends? The truth is, there are some people enveloped in Christian religion. I believe the Bible was very clear about that in a section called Matthew (chapter 7, verses 21-23). However the power that is behind the true relationship with Jesus cannot be disputed. Unfortunately for David there was a reason Jesus spoke in parables; I will pray for him. Thanks for sharing Frank; your words are always so true! As reaching4hishem mentioned, there are many people trapped in dead, dull traditional Christianity. So it is very understandable why people like David raise this point. We need to reference a section of the Bible called “Acts” to see how the early church operated in the gifts of God’s Spirit. In Acts, a character named Simon the sorcerer was so impressed by the power of God in operation that he asked if he could buy the gift of God’s spirit! Perhaps if David Foster saw the power of God at work in a believer’s life, he, too, would be convinced of the reality of God and would begin seeking for that same relationship! Thank you for your excellent post, it’s a very interesting read. Religion is a man made way of functioning, true Christianity is living by a set of God-ordained guidelines. I find it strange how people can call Jesus my ‘imaginary friend’, and yet history proves his existence. The question is not is Jesus real, but is He the son of God? If he isn’t, he’s dead and buried a long time ago. If he is, then He is in heaven as the bible describes. If he’s in heaven, and the Son of God, then while it may not be physically possible to see and hear Jesus, it certainly could be spiritually. After all, the Bible clearly states that “God is spirit, and must be worshipped in spirit”. Christians who worship, then, aren’t treating Jesus like a boyfriend or girlfriend, but as a lord an saviour to be honoured and served. The saddest part is that people choose to worship everyday, but they’d rather worship celebs and movie stars rather than the Creator of life, and Saviour of the world. Even if nobody believes in religion, do they believe in history. Was the Roman Empire imaginary then, including the emperors of the Roman Empire, such as Herod the great? If Jesus is imaginary, so was Herod Antipas who beheaded John the Baptist and the whole Roman Empire. 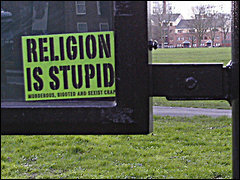 Religion is not stupid, but to argue with those who does not believe in religion is stupid.